With the 2016 presidential race on the horizon, a nonprofit organization is taking strides toward bringing national housing policy issues to the forefront, including continually rising rents. The J. Ronald Terwilliger Foundation for Housing America’s Families wants to bring the “silent” housing crisis to the national conversation and the domestic policy agenda with its inaugural initiative. 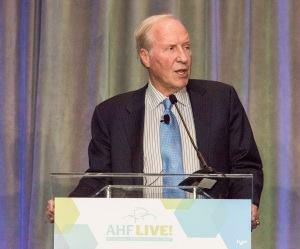 Ron Terwilliger, former CEO of Trammell Crow Residential, spoke about the increasing need for affordable rental housing at AHF Live: The Affordable Housing Developers Summit in Chicago. At the conference in November 2014, he announced the formation of the nonprofit and said that he planned to recruit Pamela Patenaude. Patenaude is the former assistant secretary for community planning and development at the Department of Housing and Urban Development and worked as the director of housing policy at the Bipartisan Policy Center. “A legacy of the Great Recession, the rental affordability crisis is often overlooked by policymakers, ignored by the media and underestimated, at best, by the general public,” he said at the summit. Alongside the foundation’s official launch, it will be releasing the first in a series of white papers to document the real estate and rental industry. Terwilliger and the rest of his team are eager to get through political roadblocks to make this issue more broad and well-known. According to the November speech given by Terwilliger, he believes that the homeownership rate will fall to around 60 percent while demographic changes will lead to an increase in demand for rental homes. One major shift he sees taking place is with the growing number of Americans 65 and older who will likely move back to renting. Because many homes are unfit for older individuals, he says, renting will become the prominent option for them. The issue of affordable housing is taking place throughout the nation, according to a recent report by the Urban Institute. The research found that there is no county in the U.S. that has enough affordable housing available. The cost of rent has been increasing since 2000, despite the fact that the number of families needing affordable homes is also increasing. The study found that in 2013, 28 of every 100 extremely low-income families can afford their rental home. Although this figure is 25 percent lower than where it was in 2000, there is still an obvious disconnect. This is causing more families to seek assistance through the U.S. Department of Housing and Urban Development. In 2000, about 57 of extremely low-income families were in need of help from HUD, which is now at a surging 80 percent. According to Terwilliger, federal assistance is underfunded and typically supports homeownership rather than renters. He believes that the preservation and expansion of the Low-Income Housing Tax Credit program is the most effective tool in ensuring that affordable housing is made available to low- and moderate-income families. He also said that one of the most important things his foundation intends to do is to develop a deep understanding of demographic changes in the nation. How does Uber's employee vs. contractor battle affect real estate?